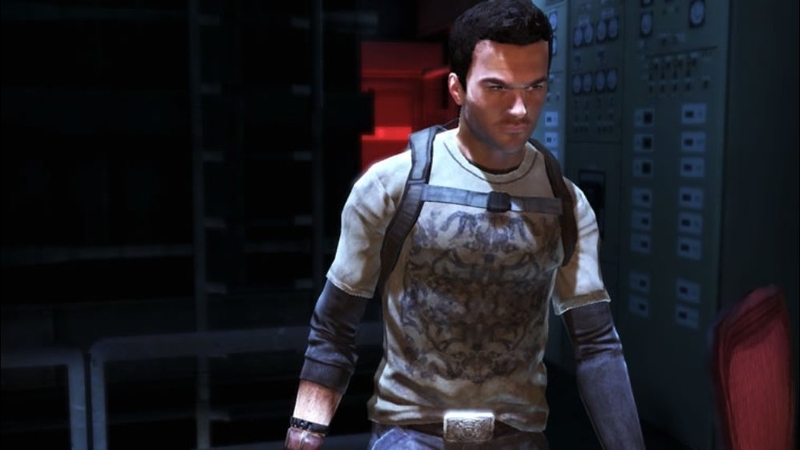 Shadow Complex Mixes classic Gameplay with Next Gen Production Values that turns into roughly 800 Megabytes of pure fun. The game pays homage in a big way to the Metroid and Castlevania Series while trying a few new things. In my opinion it was the best offering from the 2009 Summer of Arcade line up, as well as being one of the best Live Arcade games since well, ever. This is probably the weakest element of the game. Basically girl gets kidnapped, guy tries to save her and uncovers a crazy plot to take over the government, and must use the enemies' weapons against them to save the day. There are only a few cutscenes as well, so the narrative definitely takes a backseat in this game. 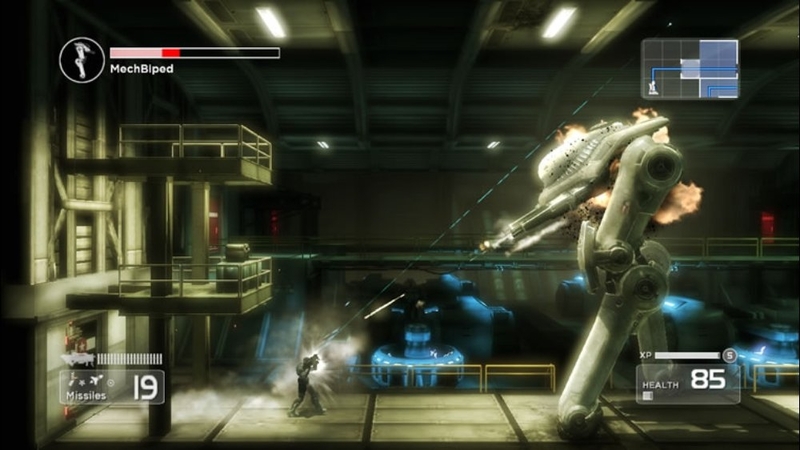 The Visuals in Shadow Complex can be compared to many retail games in terms of what we expect from games. Chair Games used the Unreal Engine, which does a great job of showing how Xbox Live Arcade games can be equally compared to games on Retail discs. 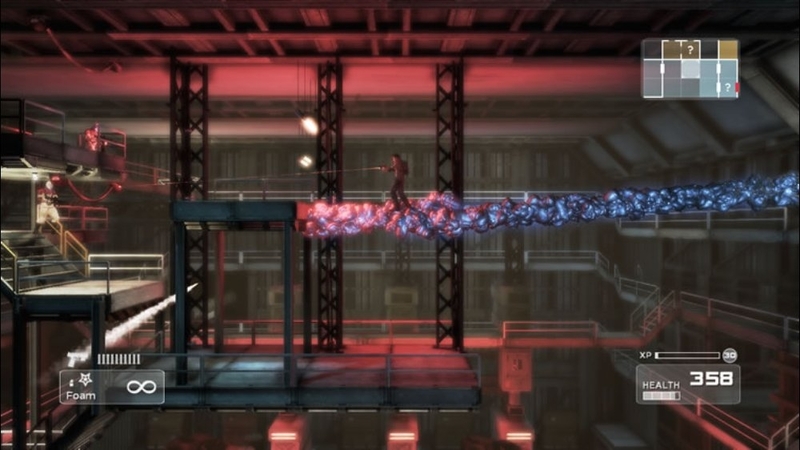 The Characters, environments, and effects all look great, with many awesome features including rag-doll animations, huge explosions, and easily identifiable enemies help make Shadow Complex stand out among the many Arcade games and even can hold it's own against the visually stunning Braid. Jason Flemming doesn't really stand out as a unique guy, but that's alright since he's just a regular guy from start to finish, besides looking like a total super hero once you don the entire Omega Armor set in the game. The Enemies are not all clone like either, with many looking slightly different to possibly show their rank in the Restoration. Overall the visuals do not disappoint, especially the water effects, since Chair also made Undertow. This is what Shadow Complex does best. All the classic exploration elements from 2d games are here, and the action is even more intense than those games as well. You will see items and areas that appear impossible to obtain at first, only teasing you since you will need a tool currently not in your arsenal to obtain them. The flashlight's job is to light up dark areas, but also tell you what item you will need to use on a specific object: Orange for Guns, Green for Grenades, Red for Missiles, Purple for The Foam gun , and Blue for Super Speed. Throughout the game, you will also obtain many devastating weapons and items, so look carefully in the areas of the game. 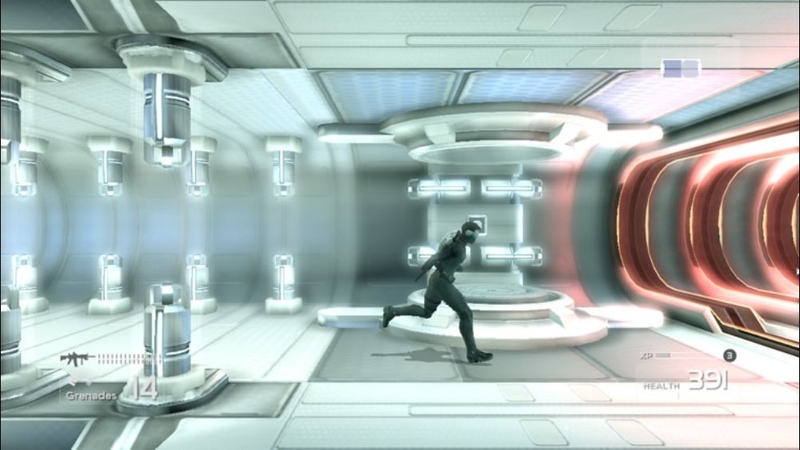 Shadow Complex' level system will help you obtain items faster and easier, and ultimately makes a fun game even funner. 50 is the game's highest, but you can still gain experience after you reach the peak. The controls are near perfection, with the right analoig stick for aiming to pull off some nice headshots, and the bumpers for using your special items. This one of the few games out there where I didnt have a need to change the default controls. The Music is great and the sound effects are pretty neat as well. Running across a lake at super speed sounds like you might imagine it to be. Nolan North does a great job as Flemming, although I wish he had more to say. The games script and dialogue felt like it could fit on less that 4 pages, but for an arcade game, I guess it's fine. Guns and enemies sound great, so no complaints from me. Ive beaten Shadow Complex 4 Times, so I would say its pretty high. It's fun to see where you rank on the leaderboards and against your friends, and speed runs are fun to do and make you go back through the game in hopes of shaving off a few precious seconds that may rank you higher on the boards. Plus your level stays the same, which means you basically have to play multiple time in order to get to 50. Shadow Complex is definitely worth the 1200 points and the slight hope of DLC down the line is a good reason to download the game as well.